The Buddy Cop film gets a re-skin with two unorthodox female leads. It is more of a cartoon than a buddy cop comedy. FBI agent Ashburn (Sandra Bullock) is an uptight, emotionally closed off woman looking for a promotion. Her opportunity comes from settling another case, a case already taken by an obnoxious, loud mouth local cop who will do anything to get her way. 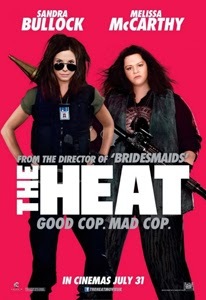 I’d like to start by saying, I don’t think The Heat is my sort of film. I was optimistic having seen parts of it, but I really found a lot of it to grate on me. This film is more of a cartoon than anything else. Our two officers work with ridiculous impunity, or rather… Melissa McCarthy’s Mullins character does. I know it is a comedy but she doesn’t obey any laws, ANY laws, and I found it really mean spirited at times. Particularly against Sandra Bullock’s character, who seems to start out as the intelligent shut-in, but constantly gets slammed, insulted, turned down and offended by every other character, especially from Mullins. Mullins herself just spouts slander and curse words, overacting everything and chewing all the scenery. What gets me most wound up is how hopeless Ashburn becomes. She never gets a time to shine, unlike Mullins who gets away with everything she wants; its like a spoiled child kicking a helpless puppy. There’s no resolution either, at least not in a good way. Ashburn has to learn to respect local police officers (the rub of her personal conflict) yet Mullins is a genuinely unpleasant person, and should have someone like Ashburn to teach her restraint, but is instead hero worshiped by the film’s narrative! So the characters are unfortunately lost on me. But in my mind this film is a typical case of role-reversal. They don’t overly act like women, at all, they act like men in a buddy cop movie (making the film a dad generic too) Every man in this film is reduced to a pathetic, whimpering idiot (or a clueless jerk) usually to provide Mullins with someone to scream abuse at. Now sure, many male dominated movies have women dumbed down, but usually there’s one or two women who are on their level, someone to help, save or give them redemption. Not here. All the men are jerks, evil, idiots or just passives who get pushed aside by McCarthy’s unending fury. So… did I like anything? The characters and the themes of the film I found awful, misguided and aggressive, but the comedy elements and scenarios included were funny. Early on we see Mullins chasing down a drug peddler, they arrive at a fruit stand and Mullins literally throws a huge watermelon at him, smashing him to the floor. The slapstick comedy here is far superior to the written comedy. The music is good too. God, I’ve fairly panned this film. Women will like this film (though not wanting to be a generalist or a hypocrite in saying so) as it is a cartoonishly over-proportioned fantasy. The Heat is a blotched buddy cop movie, at best it is a cartoon without consequences. As a male viewer, I can say I’ve seen better.